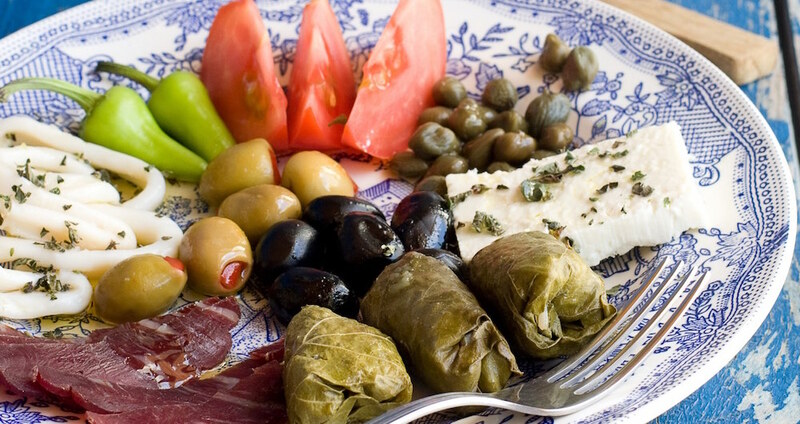 Traditional Greek cuisine is a paradigm of the Mediterranean Diet. Many of the country’s food customs derive from the fasting dictates of the Greek Orthodox calendar, which means an abstention from all animal products and fish (but not seafood, which is bloodless) for about half the year. As a result, traditional Greek cuisine has countless main course vegetarian dishes, based on seasonal Greek ingredients, beans and legumes, wild greens, pasta and rice, and more. Meat in traditional Greek cuisine and cooking was mainly reserved for the Sunday meal and for festive occasions. The main animal proteins in the Greek diet are lamb and goat, pork (especially in rural communities), poultry and some game. Fish and seafood, of course, are a seminal part of the Greek diet. The iconic Greek fish and seafood dishes are whole, grilled fish and octopus, but there are innumerable recipes for stewed, baked, and stuffed seafood and fish, often in combination with vegetables and beans. Many traditional Greek cuisine’s dishes, in fact, call for combinations of vegetables, beans or rice with more expensive proteins. This was a way to stretch the larder in times of want. Traditional Greek cuisine is based on the seasons. A typical Greek table is rarely set forth in courses, but rather filled with a variety of dishes nibbled at over long meals. This is the “meze” tradition, where wine and other alcoholic beverages play an important role. This is part of Greek culture. Small plates of savory foods that vary in color, texture, temperature, and spiciness are shared and always accompanied by something to drink. All in all, traditional Greek cuisine and cooking are healthy, convivial, and delicious, because extra-virgin Greek olive oil plays a major role as a cooking fat and dressing (raw) in most Greek dishes, even in many sweets. The Greek diet, with Crete as its most famous paradigm, is the quintessential Mediterranean diet, based mainly on vegetables and olive oil, although so many of its other elements of have also come under scientific scrutiny and have been found to be beneficial to health. Among them: snails, the immense variety of wild greens, Greek honey, specific Greek cheeses made not from cow’s milk but from sheep’s and goat’s milk, wine, tsikoudia (tsipouro), or eau de vie, which is thought to spur metabolism. The Mediterranean diet, in fact the Greek diet (Cretan diet) ultimately is really about the region’s lifestyle, where meals are not only inherently healthful but also social occasions for family and friends to gather. There is little stress and much joy in eating the way a traditional Greek does. All these things combined make for what is now coined the Mediterranean Diet.